You can execute AWS Systems Manager Automations across multiple AWS Regions and AWS accounts or AWS Organizational Units (OUs) from an Automation management account. Executing Automations in multiple Regions and accounts or OUs reduces the time required to administer your AWS resources while enhancing the security of your computing environment. For example, you can centrally implement patching and security updates, remediate compliance drift on VPC configurations or Amazon S3 bucket policies, and manage resources, such as Amazon EC2 instances, at scale. The following graphic shows an example of a user who is executing the AWS-RestartEC2Instances document in multiple Regions and accounts from an Automation management account. The Automation locates the instances by using the specified tags in the specified Regions and accounts. When you execute an Automation across multiple Regions and accounts, you target resources by using tags or the name of an AWS resource group. The Automation fails to run on those resources that don't have the specified tag or that aren't included in the specified resource group. Your account is charged for executing Automations in multiple Regions and accounts. Multi-Region and account step executions are considered special steps. There is no step limit for special steps, but your account is charged for each step processed by Systems Manager. For more information, see the AWS Systems Manager Pricing page. Verify that all resources on which you want to execute the Automation, in all Regions and accounts or OUs, use identical tags. If they don't, you can add them to an AWS resource group and target that group. For more information, see What Is AWS Resource Groups? Sign in to the AWS Identity and Access Management (IAM) account that you want to configure as the Automation Master account. Use the procedure in this topic to create an IAM execution role called AWS-SystemsManager-AutomationExecutionRole. This role gives the user permission to execute Automation workflows. Use the procedure in this topic to create a second IAM role called AWS-SystemsManager-AutomationAdministrationRole. This role gives the user permission to execute Automation workflows in multiple AWS accounts and OUs. Choose the Automation document, Regions, and accounts or OUs where you want to execute the Automation workflow. Use the GetAutomationExecution, DescribeAutomationStepExecutions, and DescribeAutomationExecutions API actions from the AWS Systems Manager console or the AWS CLI to monitor workflow progress. Use the following procedure to create the required IAM roles for Systems Manager Automation multi-Region and multi-account execution by using AWS CloudFormation. This procedure describes how to create the AWS-SystemsManager-AutomationExecutionRole role. You must create this role in every account that you want to target to execute multi-Region and multi-account Automations. This procedure also describes how to create the AWS-SystemsManager-AutomationAdministrationRole role. You only need to create this role in the Automation management account. Download the AWS-SystemsManager-AutomationExecutionRole.zip folder. This folder includes the AWS-SystemsManager-AutomationExecutionRole.json AWS CloudFormation template file. In the Choose a template section, choose Upload a template to Amazon S3. Choose Browse, and then choose the AWS-SystemsManager-AutomationExecutionRole.json AWS CloudFormation template file. On the Specify Details page, in the Stack Name field, enter a name. In the Parameters section, in the MasterAccountID field, enter the ID for the account that you want to use to execute multi-Region and multi-account Automations. On the Options page, enter values for any options you want to use. Choose Next. On the Review page, scroll down and choose the I acknowledge that AWS CloudFormation might create IAM resources option. AWS CloudFormation shows the CREATE_IN_PROGRESS status for approximately three minutes. The status changes to CREATE_COMPLETE. Repeat this procedure in every account that you want to target to execute multi-Region and multi-account Automations. Download the AWS-SystemManager-AutomationAdministrationRole.zip folder and repeat this procedure for the AWS-SystemManager-AutomationAdministrationRole role. You only need to create the AWS-SystemManager-AutomationAdministrationRole role in the Automation management account. AWS account IDs or OUs where you want to execute the Automation. AWS Systems Manager Regions where you want to execute the Automation. The tag key and the tag value, or the name of the resource group, where you want to execute the Automation. In the navigation pane, choose Automation, and then choose Execute automation. In the Automation document list, choose the option beside a document name. To view more Automation documents, use either the Search bar or the numbers to the right of the Search bar. You can view information about a document by choosing the document name. Default version at runtime: Choose this option if the Automation document is updated periodically and a new default version is assigned. Latest version at runtime: Choose this option if the Automation document is updated periodically, and you want to execute the version that was most recently updated. 1 (Default): Choose this option to execute the first version of the document, which is the default. On the Execute automation document page, choose Multi-account and Region. In the Target accounts and Regions section, use the Accounts and organizational (OUs) field to specify the different AWS accounts or AWS Organizational Units (OUs) where you want to execute the Automation. Separate multiple accounts or OUs with a comma. Use the AWS Regions list to choose one or more Regions where you want to execute the Automation. Use the Multi-Region and account rate control options to restrict the Automation execution to a limited number of accounts running in a limited number of Regions. These options don't restrict the number of AWS resources that can execute the Automations. In the Location (account-Region pair) concurrency section, choose an option to restrict the number of Automation workflows that can execute in multiple accounts and Regions at the same time. For example, if you choose to execute an Automation in 5 AWS accounts, which are located in 4 AWS Regions, then Systems Manager executes Automations in a total of 20 account-Region pairs. You can use this option to specify an absolute number, such as 2, so that the Automation only runs in 2 account-Region pairs at the same time. Or you can specify a percentage of the account-Region pairs that can execute at the same time. For example, with 20 account-Region pairs, if you specify 20%, then the Automation simultaneously executes in a maximum of 5 account-Region pairs. Choose targets to enter an absolute number of account-Region pairs that can execute the Automation workflow simultaneously. Choose percent to enter a percentage of the total number of account-Region pairs that can execute the Automation workflow simultaneously. Choose errors to enter an absolute number of errors allowed before Automation stops sending the workflow to other resources. Choose percent to enter a percentage of errors allowed before Automation stops sending the workflow to other resources. In the Targets section, choose how you want to target the AWS Resources where you want to run the Automation. These options are required. Use the Parameter list to choose a parameter. The items in the Parameter list are determined by the parameters in the Automation document that you selected at the start of this procedure. By choosing a parameter you define the type of resource on which the Automation workflow runs. Use the Targets list to choose how you want to target resources. If you chose to target resources by using AWS Resource Groups, then choose the name of the group from the Resource Group list. If you chose to target resources by using tags, then enter the tag key and (optionally) the tag value in the fields provided. Choose Add. In the Input parameters section, specify the required inputs. Optionally, you can choose an IAM service role from the AutomationAssumeRole list. You may not need to choose some of the options in the Input parameters section. This is because you targeted resources in multiple Regions and accounts by using tags or a resource group. For example, if you chose the AWS-RestartEC2Instance document, then you don't need to specify or choose instance IDs in the Input parameters section. The Automation execution locates the instances to restart by using the tags you specified. Use the options in the Rate control section to restrict the number of AWS resources that can execute the Automation within each account-Region pair. Choose targets to enter an absolute number of targets that can execute the Automation workflow simultaneously. Choose percentage to enter a percentage of the target set that can execute the Automation workflow simultaneously. Choose percentage to enter a percentage of errors allowed before Automation stops sending the workflow to other resources. Open the AWS CLI and run the following command to specify your credentials and a Region. You must either have administrator privileges, or you must have been granted the appropriate permission in AWS Identity and Access Management (IAM). Execute the following command to execute an Automation workflow in multiple Regions and accounts. 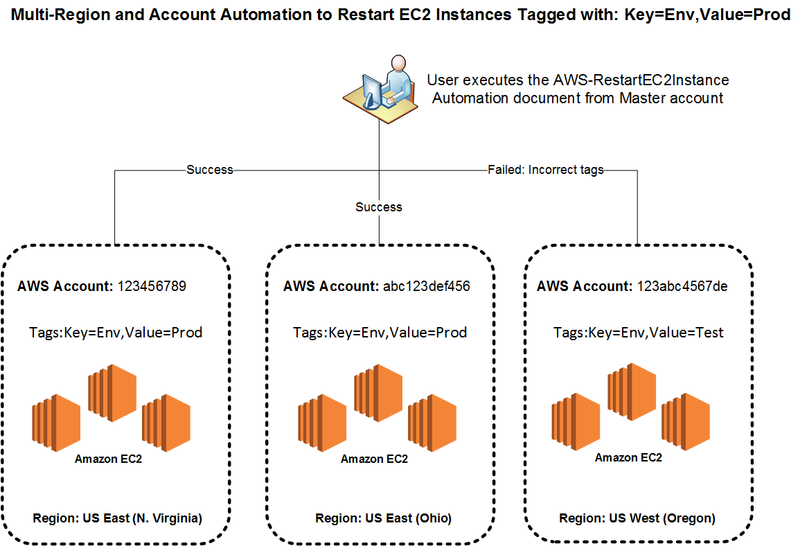 Example 1: This example restarts Amazon EC2 instances in the 1a2b3c4d5e6f7g8h and a1b2c3d4e5f6h7 accounts, which are located in the us-east-2 and us-west-1 Regions. The instances must be tagged with Env-PROD. Example 2: This example restarts Amazon EC2 instances in the 1a2b3c4d5e6f7g8h and a1b2c3d4e5f6h7 accounts, which are located in the eu-central-1 Region. The instances must be a member of the prod-instances AWS resource group. Example 3: This example restarts Amazon EC2 instances in the ou-1a2b3c-4d5e6c AWS Organizational Unit. The instances are located in the us-west-1 and us-west-2 Regions. The instances must be a member of the WebServices AWS resource group. Execute the following command to view the workflow execution. Execute the following command to view details about the execution progress. You can also monitor the status of the workflow in the console. In the execution list, choose the execution you just ran and then choose the Steps tab. This tab shows you the status of the workflow actions.